Here’s a great site on older toy and hobbyist robots; if you’re a collector or just a nostalgist, it’s a must-see. (Maybe some here have never seen my late 70s robot Cosmo Klein.) Alas, the link came from an old email sent by the late George M. Ewing WA8WTE, who suggested it as an Odd Lot. Better late than never. No tablet here yet (waiting to see what if anything pops up at CES 2012) but I’m tempted to get a Nook Color so I can at least quit reading ebooks on my dinosaur of an X41. My friend Erbo has learned a lot about rooting it and running CyanogenMod, and has much good to say about the combo. If you’re considering that step, consider the peculiar nature of the Android OS itself, which may not exist in precisely the same way that Windows exists. This is still good, but you need to understand it, as it’s a newish thing in the computing universe. I’ll never buy one of these, but I admire the concept: An off-the-shelf smartphone-controlled video-equipped RC helicopter. And I admit: If it weren’t for OWS I wouldn’t have heard of them at all. Henry Law called my attention to the fact that County Down in Northern Ireland is often called “Drumlin Country” because of its landforms. 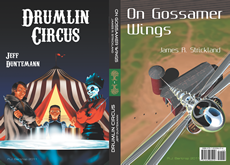 Odd then that “The Star of County Down” is one of my favorite Irish folk songs, and has been since I first heard it circa 2000–which is precisely when I wrote “Drumlin Boiler,” the first tale in the Drumlins Saga. Talk partisan political hatred all the time, and prepare to reap the wind. And with that, the curtain falls on 2011. May the impact of the curtain give it multiple broken bones, concussions, contusions, internal bleeding, hemorrhoids, the heartbreak of psoriasis, and whatever else it might take to keep this year from darkening our doorsteps ever again. Christmas is coming a little late here. Christmas won’t entirely arrive, in fact, until a week from today–by order of the Lord of This Particular Castle. To avoid having our lower level out of commission until the vernal equinox, Carol and I have been furiously shopping for carpeting and slobbering paint-color samples on the walls, and getting estimates from painters and carpet layers. We lacked time and (especially) energy to mount a real Christmas tree, and when I went downstairs to hunt up my Lionel trains, I found that a couple of key boxes were blocked in behind all the other boxes of miscellany I had to pack up to prepare for the mudjacking. So no trains either. This is why you haven’t seen much from me recently. We’ve done a lot of remodeling in our lives and always hated it. By the end of the day I’ve been in no fit mood to write much of anything at all. Carol and I have mostly sat on the couch covered with bichons while the smoke stopped pouring out of our ears. We did spend Christmas Proper with a few close friends, but almost entirely avoided the six weeks of furious tearing around that a conventional Christmas seems to require. In doing so, I had an insight: Christmas as it has come down to us is almost entirely a backward-looking holiday. By 3 PM on Christmas day, the radio stations are playing colorless pop music again, and the wrapping paper has mostly been shoveled into the recycle bin. It’s over. All around the country, I can imagine exhausted Christmasers falling into their LaZBoy chairs and pondering the madness that has just concluded: endless mall-crawling, cranky relatives, dissatisfied toddlers, overly ambitious Christmas parties and dinners, toys that failed to assemble correctly, cakes that failed to rise, cookies that caramelized without benefit of caramel, and the supicious whiff of dog pee on the tree stand. In most years I can deal with all of that, even if, yes, I’m worn out when it’s over. Christmas for us began on Christmas Eve. It will continue until the Feast of the Three Kings on January 6, a date my mother always called “Little Christmas.” I will play our Christmas CDs, put egg nog in my coffee, and keep the embargo on sugar lifted until that day. I will reflect that most of what I have ever wanted is already my own: mind, means, mettle, a soulmate who has stood beside me for 42 years, four great dogs, three thousand books, a unique moment in history, and all the tube sockets I could ever use. (Hair, meh. It just gums up the sink.) Carol and I will revel in the peace and quiet that began to reign at 3 PM on December 25th, and make a point of consciously reveling in that peace and quiet until, well, something else noisy and unavoidable rises out of the mist. We will look forward to it. Forward, in expectation. Not backward, in exhaustion. Merry Christmas, all of you. Stay alive. Stay in touch. Don’t look back. The Nook Tablet is no longer rootable, thanks to a recent stealth update applied automatically when the device connects to the Internet. The big deal with the mod is that sideloaded apps can no longer be installed; all you get are what’s available from the B&N app store. Lose a few, win a few: Amazon no longer blocks rival ebook apps on its Kindle Fire almost-a-tablet. I always roll my eyes when people say things like <YEAR> will be the Year of the <WHATEVER>. However, I’m inclined to believe that Android may finally begin coming of age in 2012, and I’m hoping to score a 10″ ICS tablet once I find one with an external card slot and (ideally) USB charging. Xoom 2/Xyboard is off my list because it doesn’t have an external card slot. I also agree with the review (having a Verizon-issued Droid X2 now) that the Verizon app store is hideous. This may well be the smallest possible USB thumb drive. No, I don’t want one. I might inhale it. Joe Bryer, who sent me the coal samples I described yesterday, has posted some nice videos on YouTube about using coal for home heat. My very talented Taos Toolbox 2011 colleague Lisa Nohealani Morton had her name tattoed on her arm–in binary. I myself am no stranger to binary, but if you don’t believe me you can translate it using a binary-to-text translator. What if you’d been at my high school lunch table in the spring of 1970? This is what you would have seen. I boggle a little at my then-habit of drinking milk and lemonade at the same meal, but I’ve done (and worn) far weirder things in my life. Offered without comment: The continents can be rearranged to form a chicken. We got 10″ of new snow last night, and it’s still coming down. Given that it’s going to be a winter blunderland out on the streets today, we decided to stay inside and get a few things done closer to home. One of these things was to spend a little time measuring the resistance of coal. Reader Joe Bryer was good enough to send me eight pounds of coal samples, in two Ziploc bags. One bag was high-quality Pennsylvania anthracite. The other was bituminous, its origins unspecified. To take the measurements, I made a jig out of a piece of scrap plastic. I drilled two .0785 holes a quarter inch apart. The distance was arbitrary. (The size of the holes is that of standard probe tips.) The idea was simply to make all measurements with the same distance between the probes. I measured several spots on five pieces of bituminous, and in all cases the resistance was higher than my DVM’s top reading of 20 megohms. The anthracite was a completely different story. The resistance varied from place to place on any given sample, and varied widely even on a single sample. The highest readings I got were in the vicinity of 180K ohms. The lowest was 12K. I wiped the samples with a dry rag prior to testing them. This is promising. The 1/4″ spacing between the probes was not quite arbitrary. The carbon button microphone element in an old-style telephone is about 1/4″ in size. I have several of those in the drawer and all of them tested at between 5K ohms and 10K, depending on how you orient the element, and whether you tap it with a screwdriver. It is, after all, just a little container of small carbon grains. So I think it would be worthwhile sifting some sand-sized granules of anthracite and trying them in a mic element lashup. The next thing to test is carbon from barbecue briquettes, which I will have to beg from friends since I no longer burn charcoal for grilling. If I can find some of the drafting pencil leads I used in drafting class umpty years ago, I’m going to grind them up and test them as well. (My friend Joe Flamini W4BXG says that he’s done that himself.) In the meantime, I have a place to start, and will now set my mind to building a microphone lashup to test conductive particles in. More as I manage it. My friend George Ott surprised me with a lump of coal yesterday morning, after church over at St. Raphael’s. He even wrapped it and put a ribbon on it! I could barely stand the wait to get home and check its resistance. And (drum roll, please) the lump is…an insulator. Or a damned reasonable facsimile. With my DVM set on its 20 megohm scale, the resistance didn’t read at all, even with the probes set pretty firmly in the coal about an eighth of an inch apart. I tested at eight or ten different points on the lump, since carbon is funny stuff generally and coal is not a uniform substance. The DVM reads a 10 megohm resistor right on the money, and failed to read a 22 megohm unit. I use that DVM a lot and certainly haven’t seen anything wrong with it. But no matter how close I set the probes, I got no reading at all. I put the lump against my belt sander and ground a flat face, which was interesting in terms of the tarry smell that came off the lump. No difference. I whacked a corner off the lump with a coal chisel. No difference, even on the fresh and very shiny fracture face. With the clean and very sharp points of the probes no more than a sixteenth of an inch apart, the resistance was higher than 20 megs. Wow. I’m not enough of a rockhound to know what sort of coal it is, and George didn’t know either. (He got it from a blacksmith who fires his forge with coal.) It looks like anthracite in that it’s quite shiny, but beyond that I just don’t know. Another of my readers is sending me a sample of both anthracite and bituminous, and that may help. Some of the online sources I’ve read describe coal as a semiconductor, but I think by that they only mean a substance with significant resistance. I’ve seen nothing to indicate that some types of coal would be insulators across very small fractions of an inch. However, among other projects I hope to get to this winter is a crystal detector lashup, steampunk style, on an oak base with a copper pipe cap to hold a mineral sample for testing as a cat-whisker detector. One doesn’t think of coal as a candidate, but it certainly won’t take much work to do the science! Talk about a weird feeling: I stood downstairs in one of the bedrooms after the mudjacking crew had drilled six 1 3/4″ holes through the 6″ slab and down almost two feet into the soil. They stuck a hose as thick as my arm through each of the holes in turn, forcing liquid concrete into the soil. Once all the holes had gotten a dose, the hose was moved to a hole near the north wall, and the crew boss pressed the pump button once, twice, three times. I watched as the slab rose smoothly, almost half an inch in the space of two seconds. Whoa. It’s been a messy, dusty, ad-hoc sort of project. In summary: They drill a number of holes through the slab. (In our case it was seventeen.) They pump liquid concrete (“mud”) through a hose into the soil and/or voids under the slab. The voids fill up as the soil rises beneath the slab. Eventually, with no more voids to fill, the pressure of the liquid concrete lifts multiple tons of concrete slab back to where it was before it began to sink. The liquid concrete stabilizes the soil beneath the slab, and with some luck we won’t see the slab settle again. There were a few weirdnesses. Here and there liquid concrete forced itself up between the slab and the stem walls (and out of a few of the holes as well) like a glistening blob in a third-shelf horror movie. The bathtub didn’t quite return to its former position and may have to be pulled and re-set. Still, as best we can tell, the operation was a success and the patient not only survived but rose from the dead. There’s much mess down there still, with plastic taped up all over the place and my fiction and magazine stacks all boxed and inaccessible, but the flaw that precipitated the whole business has at least been dealt with. Given that we had to empty the rooms completely, we decided to pull the carpet and replace it. And with the carpet gone, there’s no reason not to re-paint. Carol has been meeting with decorators. I’m designing a new layout for the furniture. It will have been a huge amount of work (and way, way too much money!) but when we’re done, the lower level will look very good. More on the project as it happens. The wind you heard through the pines last night, however, was a massive sigh of relief. I haven’t been bad. I’ve been curious. A question occurred to me the other day while I was hauling boxes around the lower level: Does coal conduct electricity? And if so, how well? I know that carbon does, but of course you have to specify which kind of carbon. Diamonds do not conduct electricity. Carol’s engagement ring is big enough for me to have put an ohmmeter across its large facet thirty-odd years ago. The carbon rods running down the centers of conventional carbon-zinc batteries conduct very well. Mechanical-pencil lead conducts electricity. Resistors, in fact, were basically painted lengths of pencil lead until relatively recently. Coal, now. Hmmm. I would run downstairs and do the science right this minute, but I’m not sure I’ve held a piece of coal in my hand for forty years. Uncle Joe Labuda burned anthracite in a coal stove to heat his flat down Back of the Yards around 1960. I was fascinated by the lumps of coal in the bin behind his stove for their luster and even more by their smell, which was a less acrid form of the coal smoke that hovered over the neighborhood all winter, at least until people started installing natural gas space heaters. Online research suggests that the resistance measured across the thickness of a one-centimeter cube of anthracite runs from the mid-hundreds to low thousands of ohms. That suggests that sand-grain sized particles of coal could be used to create a carbon button microphone. My friend Art Krumrey actually did this circa 1963, by beating on a carbon rod yanked out of a dead flashlight battery, and loading the grains between a soda bottle cap and half of one of the thin steel puck-shaped containers that large rolls of Scotch tape used to come in. He basically duplicated the circuitry of a primordial telephone connection, and we sent our voices over fifty feet of wire without any active devices at all, just a few dry cells in series with the cobbled-up carbon mic and a pair of dynamic headphones. It was boggling how loud the audio was, so loud that it overloaded the headset unless we spoke in practically a whisper. This was how telephone systems worked before amplifier tubes were invented: The voice audio signal coming out of the carbon mic was already high-level, being a variable resistance in series with a high-current power source. In fact, electromechanical repeater amplifiers were created by mechanically coupling a dynamic earpiece to a carbon button mic. With decent batteries to drive the system, repeater chains like that could carry voice signals hundreds of miles without a vacuum tube in sight. What I really want to know is whether a steampunk-era garage inventor could have created a usable carbon button mic using granules of coal, of if purer carbon would be required. If I can find a lump of coke that might work better, and turning coal to coke is not exactly alchemy. (I’m not sure I want to do it myself.) If the resistance of a lump of good anthracite were low enough, it could also function as the cathode of a carbon-zinc primary battery, which would be interesting all by itself. Water-cooled carbon mics the size of pie pans were used in series with high-speed alternators to generate voice-modulated RF before the advent of RF power tubes. It’s a delicious steampunkish concept, full of sparks and ozone and odd things turning too quickly for their own good. Of course, I have a Drumlins World story concept that involves simple electromechanical wireless voice transmission systems. The sinister Bitspace Institute has a very secret radio communications network, and when a pair of spindly teenage boys independently invent spark radio, well, interesting things happen–especially when you throw a few drumlins into the mix. Still taking notes, but even a few ounces of good coal could make for some interesting experiments, just as my steampunk Geiger counter did last year. Once the lower level is done I hope to lash something up to measure the effectiveness of different kinds of carbon granules in microphone service. Whether the story itself gets written or not, I expect to learn something, and that’s good enough for me. The place is a mess. Not as messy as it’ll be by tomorrow night, but it’s still a mess. The movers got everything transferred to the uncarpeted portions of the lower level yesterday, and the carpeting has been pulled up. Plastic tarps are all over the place. Tomorrow the drilling begins. In the meantime, when Carol and I broke for lunch an hour ago, I tried something completely different. I scrambled a single egg in a bowl, dumped some butter into the little one-egg fry pan that I’ve had for years (left) and with the burner on medium made a scrambled egg disk. I then threw a Bay’s English muffin in the toaster, and while it was toasting I broke open a Spam Single onto a Corelle plate and heated it up to a nice sizzle in the microwave. When the muffin came out of the toaster I buttered it good and proper, threw the scrambled egg disk on a muffin’s lower half, lowered the sizzlin’ Spam Single onto the egg, and then slapped the muffin lid on the whole business. Damn, that was good! Cheap, too, as lunches go. Eggs are about 20c each. Spam Singles run about a buck. A single Bay’s English muffin costs me about 40c. Might have used a nickel’s worth of butter. Total $1.65. Almost entirely sugar-free. Filled me up completely and will probably carry me all the way to suppertime without any need to snack. It would be less fattening without the English muffin, but try as I might, I can’t do completely without English muffins. The Big Honking Sliding Puzzle Project continues, and today Carol and I are mostly stuffing boxes downstairs. Mover guys coming Tuesday. The carpeting is coming out on Wednesday, and the plastic tarps will go up. Thursday they drill holes in the slab and start pumping gooey stuff underneath to stabilize the soil and raise the slab to where it originally was. We are shopping for new carpeting, and will begin choosing new paint colors tomorrow morning. The lower level will not be back in livable shape until mid-January, but when it is it will be much improved. I do not do walled gardens. I absolutely do not do walled gardens. This gentleman from Harvard Law School has done a good job capturing my unease with vendor-controlled hardware and especially software. Reader Nick DeSmith sends a pointer to a wonderful site on numeric-readout vacuum tubes of various species, from humdrum nixies to one I had never heard of before: A Compactron-based micro-CRT with ten guns. I consider Nixies at least to be steampunk-possible, since there’s no physics involved that wasn’t understood in 1900. Not sure they’ve been used in the steampunk canon so far; if they have, let me know. There were giant beavers during the Pleistocene. There have been talking beavers on TV in the past, though they weren’t all that huge. Now there’s an angry giant beaver. Don’t piss one off unless you’re wearing the right overalls. I keep tools and even a wi-fi bridge node in ammo cans. Why not wine? I’m doing one of those sliding number puzzles; you know, the ones that have fifteen tiles in a matrix that can hold sixteen, and you have to slide them around until they’re in order. Except that the matrix is the lower level of my house, and the sliding tiles are things like 7′ tall Hundevad bookshelves, credenzas, a 61″ TV set and associated tableage, a treadmill, a queen-sized bed, Carol’s desk and chair, two vertical filing cabinets, a two-drawer lateral file cabinet, eight or nine hundred books in boxes, and enough boxed back issues of QSTs to make me cease wondering where the missing mass in the universe is hiding. And that’s the abbreviated list. The goal of the puzzle is to get everything now resting on carpet onto areas where there is no carpet. The problem is, three quarters of the lower level is either carpeted or already committed to Big Heavy Things That Don’t Move, like my workbenches and shelves piled nine feet high with stuff that has nowhere else to go. On Tuesday morning bright and early, a crew of much younger guys with strong backs are going to show up here and want to know where to put everything. That means I have to tell them. And that in turn means solving the puzzle. I leveraged a good deal of work I did nine years ago, when we were gearing up to move everything from Scottsdale to Colorado Springs. I drew nearly all of the big furniture we owned at that time in Visio (or adapted furniture shapes already in the product’s stencil sets) and then drew a floor plan of the house to which we were moving. I dragged the furniture shapes around in Visio until they fit, and when the truck pulled up in front of our rental house, we gave the mover guys a printed copy of the floor plan as I drew it. A year later we did the whole thing again, this time for the new house we had spent a year building. I had to re-draw the floor plan, but the furniture hadn’t changed and the shapes were still useful. Tugging them around the plan allowed us to get the furniture where it had to go the first time, without much need later on to wrestle large massive objects onto dollies and shove them into new arrangements with my fiftysomething back. That worked well and was actually a lot of fun. It was easy, furthermore, because we had a whole house to play with. This time I have the furnace room (where much of that Big Heavy Stuff That Doesn’t Move actually lives) a single unfinished and uncarpeted bedroom, and portions of my workshop. As it happens, I can get it all in there, but the furniture must be placed in a very specific order and with considerable precision. The treadmill will clear the furnace room door with about 1/2″ on either side. (It won’t clear the other doors at all.) It’s going to be intense, my friends. The carpeting was damaged by condensate spilling out of our air conditioner this past summer, so we’re ripping it up and replacing it with something a little more robust and a little less pink. Since the carpeting will be gone, we figure it’s as good a time to paint as any, particularly the lower level great room, which looks like it was painted with melted strawberry ice cream. If you wonder we we don’t entertain guests down there, that’s certainly one of the reasons. So our most intense week in well over ten years continues apace. Carpet samples litter the great room. Vinyl flooring samples for the rear entranceway lie about next to the woodwork while we search for harmony. About six shelf-feet of component data books still need to be boxed, as well as most of the contents of Carol’s office. I’ll report our progress here as time allows. Christmas cards will be a little late this year, sorry.